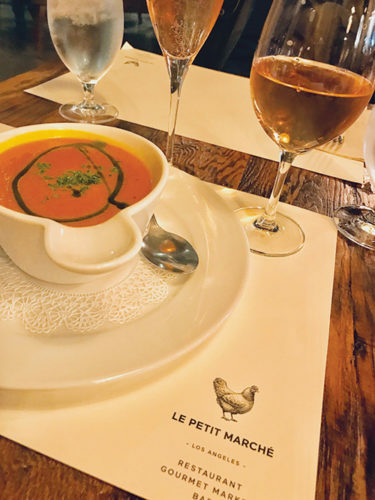 At Le Petit Marché, Spoon Singh and Mathew Cape bring authentic French cuisine to the Larchmont Village with a stellar seasonal menu, full bar and market, as well as a gourmet bakery and coffee bar. Singh, founder of Kona Brewing Company, and Cape, Paris native and founder of Hollywood’s Vinolio, previously managed The Larchmont across the street until they saw a need for a French dining destination in the area. I was excited to welcome them back to the neighborhood. Find a table for two or take a seat at Le Petit Marché’s large and inviting bar that seats around 40 people. There, alchemist Chris Kramer creates drinks free of refined sugar and syrups, instead enhancing each drink with a touch of honey, agave and almond. The dining room also features a wall of wine curated by Lou Amdur, of Lou Wine Shop. Amdur’s wine offerings includes bottles of sparkling, rosé, whites and reds from Madeira, the Jura Mountains, Sicily, the Loire Valley, Beaujolais, Italy’s Friuli region and the Canary Islands. Wine prices are less expensive than many other restaurants, and guests can purchase bottles to take home to add to their own collection. The night my husband and I dined at Le Petit Marché, we watched chef Stephane Liot in action. This talented chef trained in Paris at La Cuisine du Lycée Marie Durand, but has also lived and traveled around the world, including in England, Japan and Cuba. Each destination has provided inspiration for his cuisine. To kick off 2019, Liot has designed an all-day menu featuring breakfast items that include four different types of croissants ­– plain, chocolate, Nutella and almond – plus over 20 entrées including a croque-monsieur and California quinoa bowl with roasted banana squash, carrots and peppers. During lunch, diners can enjoy a number of sandwiches, salads, moules-frites, kale mac and cheese, a house lamb burger and several vegan options. From the dinner menu, we started with a steaming bowl of the soup of the day, a comforting carrot, ginger and yuzu soup. Others at the surrounding tables were spooning onion soup made with dark beer and a web of melted cheese on top. The eggplant salad arrived next, featuring a mound of kale with goat cheese fritters on top. The salad’s sliced beets and pears paired well with the grilled eggplant, offering a nice balance of flavors. Our server shared that the chef might change this kale and goat cheese salad to include zucchini as well. For entrées, we shared the special of the day – large sautéed scallops on a bed of black al dente rice with bok choy in a crab bisque sauce. The caramelization on the scallops added the right touch of sweetness. I also tried the pan-seared black cod, but I found it a little too salty to my liking. However, I did enjoy the Israeli couscous, charred avocado and beurre blanc with a squeeze of Meyer lemon below the fish. My husband and I both eyed the sizzling steaks with frites arriving at other tables. Singh, Cape and Liot work with celebrity chef Curtis Stone’s Gwen Butcher Shop for menu items like the 16-ounce New York steak, 16-ounce rib-eye and filet mignon. For something really outstanding, ask the server if the chef is making either his beef bourguignon on tagliatelle pasta or the chicken Basquaise with tomatoes, herbs, onions and peppers. These two dishes are specials on the winter menu and are pure comfort food. After dinner, they serve Verve coffee, and the night we dined, rich desserts including a slice of cheesecake, chocolate-covered poached pear, crème brûlée or a muesli tart covered in chocolate. During happy hour, the restaurant is filled with locals enjoying specials from 5 to 8 p.m. nightly. 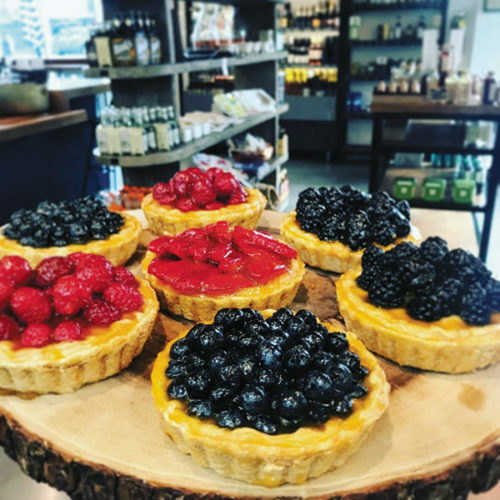 The owners also have a special delivery menu for breakfast, lunch and dinner available from 10 a.m. to 10 p.m. Just order off the menu, and groceries from the marketplace, including wine, will be delivered to your front door. Call to see if your home or office is within delivery range. Launch 2019 with a French meal that will warm your senses at Le Petit Marché. $$ 5665 Melrose Ave., Los Angeles, (323)380-6557.